Considering the intractable nature of flow shop scheduling, the primary objective of this dissertation was to develop algorithms capable of mitigating the computational burden associated with obtaining a solution for this type of problem. In view of this goal, three procedures were created. The first refers to a GA that employed discrete event simulation and customized genetic operators as a means to eliminate the evaluation of unfeasible solutions and incorporate problem- specific knowledge. The others consist of hybrid methods that have improved the aforementioned framework with the addition of local search. Having specified the main goal, it is worth to describe the secondary objectives of this work: 1) characterize the problem, 2) introduce of fundamental and state-of-the-art solution methods and 3) evaluate the proposed solutions and propose means of improvement. Flow shop scheduling encompasses allocating a number of jobs in a previously ordered set of machines so that a determined objective function such as makespan is either minimized or maximized . Despite the apparent simplicity of the problem, there is no known non enumerative polynomial time algorithm capable of solving this type of optimization, except for in those cases that can be treated by the Johnson’s algorithm or proportional flow shops. Apart from the instances that admit efficient solution methods, the computational complexity of flow shop scheduling is quite challenging because the output of the problem grows at a factorial pace depending on the size of the input. In practical terms, this means that the number of permutation schedules that would need to be exhaustively evaluated in a flow shop consisting of ten jobs and m machines is 3,628,800. Moreover, including merely one additional job expands the quantity of potential candidates in a substantial manner. In this case, the solution space would be roughly ten times larger, meaning that 39,916,800 feasible schedules would need to be evaluated. Understanding the intractable nature of flow shop scheduling, the primary objective of this dissertation was to develop algorithms capable of mitigating the computational burden associated with obtaining a solution for this type of problem. Taking this goal into account, three procedures were created. The first refers to a GA that employed discrete event simulation and customized genetic operators as a means to eliminate the evaluation of unfeasible solutions and incorporate problem-specific knowledge. The others consist of hybrid methods that have improved the aforementioned framework with the addition of local search . As will be explained in detail later, the posture adopted herein of focusing on metaheuristics is justified by the fact that traditional optimization methods such as integer linear programming     and branch and bound are unable to obtain a solution to flow shop scheduling problems that consist of moderate to large instances in a reasonable amount of time. Despite the aforementioned challenges, a series of other important problems can often be solved using these algorithms without major inconveniences. In view of this progress, the theoretical part of this work will devote a substantial amount of attention to integer linear programming, with a particular emphasis on the branch and cut algorithm . In addition to the advances verified in integer linear programming, the field of metaheuristics has also witnessed a remarkable amount of recent development. In this realm, a series of combination strategies or hybrid methods were created with the intent of improving the computational results of the many existing consolidated solution approaches. Even though other modes of hybridization may exist, the literature on the subject indicates that metaheuristics can be combined with the following techniques: local search, heuristics, integer linear programming, enumerative algorithms such as branch and bound, soft computing, problem-specific algorithms, artificial intelligence and even other metaheuristic. As will be evidenced later in further detail, methods that involve a combination with another metaheuristic or local search  often provide impressive results in terms of reducing the challenges related to the computational complexity of the flow shop scheduling problem. - Create algorithms capable of mitigating the computational complexity of the flow shop scheduling problem. - Complexity and relevance of the flow shop scheduling problem. - What are the characteristics of the problem and why it is so challenging to obtain a solution? - Fundamental methods: cutting plane methods and branch and bound. - State-of-the art methods: branch and cut and related approaches. - Fundamental methods: dispatching rules, heuristics and metaheuristics. - State-of-the-art methods: hybrid metaheuristics, NEH heuristic. o Main theoretical advance: no free lunch theorems. - How others have solved the flow shop scheduling and other discrete optimization problems in the past and what are the expected limitations? - Customized genetic algorithm with embedded discrete event simulation. - Hybrid methods that expand the previous framework by incorporating local search. - Overcoming the negative implications related to NFL theorems. - How to create solutions that will deliver good performance? - Proposed algorithms invariably converged to the exact global optimum. - Worst-case scenario for ΛGA: evaluation of 20.83% of total feasible schedules. - Worst-case scenario for ΛHGA1 and ΛHGA2: evaluation of 5.96% of total feasible schedules. - Data indicates a substantial reduction of the computational burden related to the flow shop scheduling problem. - Performance differences observed between ΛGA and ΛHGA1 are statistically significant at any conventional level. - There is no difference between the performances of the hybrid variants. - As expected, the performance of the proposed algorithms is intrinsically related to the amount of knowledge they incorporate. - Changes to the current framework using iterated greedy algorithm. - What is the performance of the proposed solutions and how can they be improved? “The distinguishing feature of discrete, combinatorial, or integer optimization is that some of the variables are required to belong to a discrete set, typically a subset of integers. These discrete restrictions allow the mathematical representation of phenomena or alternatives where indivisibility is required or where there is not a continuum of alternatives. J1. Each job is released to the shop at the beginning of the scheduling period. J2. Each job may have its own due date which is fixed and is not subject to change. J3. Each job is independent of each other. J4. Each job consists of specified operations, each of which is performed by only one machine. J5. Each job has a prescribed technological order which is the same for all jobs and is fixed. J6. Each job (operation) requires a known and finite processing time to be processed by various machines. This processing time includes transportation and setup times, if any, and is independent of preceding and succeeding jobs. J7. Each job is processed no more than once on any machine. J8. Each job may have to wait between machines and thus in-process inventory is allowed. M1. Each machine center consists of only one machine; that is, the shop has only one machine of each type. M2. Each machine is initially idle at the beginning of the scheduling period. M3. Each machine in the shop operates independently of other machines and thus is capable of operating at its own maximum output rate. M4. Each machine can process at most one job at a time. This eliminates those machines that are designed to process several jobs simultaneously like multi-spindle drills. M5. Each machine is continuously available for processing jobs throughout the scheduling period and there are no interruptions due to breakdowns, maintenance or other such causes. P1. Each job is processed as early as possible. Thus, there is no intentional job waiting or machine idle time. P2. Each job is considered to be an indivisible entity even though it may be composed of a number of individual units. P3. Each job, once accepted, is processed to completion; that is, no cancellation of jobs is permitted. P4. Each job (operation), once started on a machine, is completed to its completion before another job can start on that machine; that is, no preemptive priorities are assigned. P6. Each machine is provided with adequate waiting space to allow jobs to wait before starting their processing. P7. Each machine is fully allocated to the jobs under consideration for the entire scheduling period; that is, machines are not used for any other purpose throughout the scheduling period. P8. Each machine processes jobs in the same sequence. That is, no passing or overtaking of jobs is permitted. Having explained the assumptions and stated that there is no known efficient algorithm capable of providing an exact solution for flow shop scheduling, except for the few aforementioned cases, it is worth evidencing the substantial computational burden associated with the problem. In this realm, assuming that the abovementioned postulates hold, it is easy to perceive by briefly analyzing the data below that the number of feasible schedules grows at a factorial pace according to the number of jobs present in a given instance. Taking the relations established between the input and the output of the problem into account, the overall time complexity can be then formally expressed as O (n!) in asymptotic notation. Recalling what was previously stated, the flow shop scheduling problem admits a polynomial time solution if the number of machines is equal to two. Seeing that this type of result is obtained using the Johnson’s rule, the goals of the next section are to solve a practical example and to demonstrate how sequencing affects the makespan by either improving or hampering the flow of jobs present in the system. In view of the abovementioned objectives, this section initiates with a table that provides all the parameters required to solve the permutation flow shop scheduling problem: 1) number of jobs, 2) number of machines, and 3) processing times. As the estimates located on the coming figure will demonstrate, the makespan for the initial sequence j1, j2, j3, j4, j5, j6 is equal to five hundred and twenty time units. However, this arrangement of jobs is not optimal, since it does not promote the uninterrupted circulation of tasks. On the contrary, the schedule depicted below clearly evidences unforced idleness of jobs and machines. 1) From the table containing the processing times, find the task with the shortest duration and highlight it for the sake of simplicity. As can be easily verified, this value refers to fifty time units. 2) Having completed step one, create a horizontal table with the corresponding number of jobs. Due to the fact that the highlighted data is situated on the coordinate j5m2, this consists of inserting job j5 in the first available slot in the left. Further explaining the mechanism proposed by Johnson, if the task with the lowest processing time happened to be located under machine one, the job would have to be placed in the first available slot on the right. 3) Remove j5 from the table containing the processing times and again find the task or set of tasks with the smallest duration in the remaining set. Clearly, the minimal processing of sixty time units can be found in the cells j2m1 and j1m2. Seeing that the highlighted coordinates relate to different machines, they do not constitute a tie but can be managed through the standard job placement procedure. As a result, the next step simply involves inserting j1 into the first available slot on the left and j2 in the first on the right. Having defined the assumptions concerning permutation flow shops and demonstrated how optimizing makespan promotes an ideal flow of jobs, the next section will discuss the relevance of the problem in the wider domain of computer science and operations research. To finalize this characterization, it is worth explaining the reasons that make the flow shop sequencing problem as relevant today as it was at the dawn of operations research. While it is relatively easy to understand that improved schedules constitute an important practical tool in manufacturing, the implications of finding an efficient algorithm for this type of problem greatly surpass the gains related to increased productivity, and can actually provoke a revolution in the field of computer science and operations research. However, in order to properly clarify the impacts that may arise from the act of obtaining a polynomial time solution for flow shop scheduling and other challenging problems, it is necessary to introduce the concept of NP-completeness . In attempting to demonstrate the meaning of this idea, it has to be considered that a computer scientist often cannot come up with an efficient algorithm to solve a determined problem. Taking this difficulty into account, it is impossible to prove without a shadow of doubt that the desired polynomial time solution exists or not. To circumvent this uncertainty, this researcher has to evidence that finding an efficient algorithm refers to an improbable task. The only means of doing this is to formally demonstrate that the structure of the instance at hand is equivalent to a problem that is deemed hard through a mathematical proof called reduction. In this realm, a given instance is called NP-complete if the aforementioned procedure can be performed in polynomial time. Aside from the intricacies related to complexity theory, NP-complete problems do not necessarily need to involve austere mathematical dilemmas. On the contrary, they can also encompass recreational activities such as Sudoku, Mastermind and Candy Crush    . After all, it is not the level of formalization that makes these puzzles hard, but simply the fact that while it is easy to verify a correct solution, these games become exponentially or factorially more difficult according to the size of the input, as normally occurs in any other hard problem. Anyhow, the notion that many NP-complete problems actually make up part of the daily lives of many people gives some hope that at least one of them will be solved efficiently. manageable task with the advances in computer science, integer linear programming, heuristics, metaheuristics and hybrid methods. This statement is widely supported by several empirical papers that almost invariably point out to increased accuracy and reduced time in the execution of algorithms. In addition, a relatively new set of theorems and mathematical proofs has substantially clarified the basis on which these approaches function in practice. In the worst case, it can be said with a good degree of confidence that finding an algorithm capable of mitigating the computational complexity of flow shop scheduling could possibly provide insights on how to tackle discrete optimization problems that have a similar combinatorial structure. Even though having been remarkably successful in solving large instances of several important problems, branch and cut algorithms can be applied only to a limited extent in flow shop scheduling  . Trying to explain this issue in a simple manner, the usefulness of these cutting-edge techniques relies on certain circumstances that facilitate curtailing enumeration such as the absence of symmetries, presence of strong cuts and possibility of tightening the formulation. Contrary to these requirements, the flow shop scheduling problem often contains symmetries , tends to present multiple equivalent solutions, is formulated using terms of Big M constraints and does not count with strong cuts. As a result of these factors, the use of integer linear programming is usually confined to smaller instances due to lack of progress in pruning. a. Relate to the methods that provide a known (but not necessarily favorable) degree of approximation to the optimal solution of a specific problem supported by a formal mathematical proof. b. Involve algorithms that can be executed in polynomial or fully polynomial time. c. Even though approximation algorithms can be employed in a number of scheduling problems, their usefulness in flow shop settings is very limited. a. Refer to several types of priority rules that can be used in scheduling problems. b. Invariably consist of procedures that can be executed in polynomial time. c. Although these algorithms can be optimal under certain circumstances, their practical deployment is not recommended in flow shop settings due to poor performance. a. Encompass a class methods that attempt to provide a good, but not necessarily optimal solution to a given problem. b. Involve approaches that are based upon the plausibility of a solution. c. Unlike metaheuristics, the usefulness of heuristic methods is restricted to specific problems. d. As regards flow shop scheduling, the best-performing and most extensively tested heuristics is a constructive algorithm called NEH proposed in 1983 by Nawaz, Enscore and Ham. Briefly put, this heuristic returns makespan close to three percent of the optimal with the polynomial time complexity of 0(n x m). a. Refer to a broader type of heuristic that can be a priori used in a wide range of optimization problems. b. Involve a general framework that is many times associated with some natural phenomenon. c. Convergence may or not be supported by a formal mathematical proof. Some methods such as genetic algorithms and simulated annealing are guaranteed to eventually reach an exact global solution optimum under relatively mild assumptions. d. Convergence time is often unknown due to the stochastic characteristics of many of these methods. e. With respect to the flow shop scheduling problem, Emmons and Varaiktarakis  affirm that the most relevant metaheuristic methods are simulated annealing, genetic algorithms and tabu search. f. Another possible approach to obtain a solution to the flow shop scheduling problem is to combine GA’s with local search or other metaheuristic algorithm. This class of solutions is called memetic or hybrid genetic algorithms. In brief, the flow shop scheduling problem can be solved in a variety of ways and this relatively short review merely provides a general outline about the subject. Taking this limitation into account, the next section will attempt to deepen the methodological discussion by focusing on three main frameworks: integer liner programming, evolutionary strategies, and the NEH heuristic. 1) Preprocessing equations by attempting a series of methods that seek to reduce the size of the matrix, such as eliminating redundant variables. 2) Checking the feasibility of the problem. 3) Solving the initial relaxation. 4) Attempting to tighten the formulation using preprocessing techniques that are specifically designed for integer programs. 5) Using one or several plane cut generation approaches prior to the execution of the branch and bound algorithm. This method is called cut and branch. 6) Using one or several cutting plane generation techniques directly on the branch and bound tree node prior to pruning and branching. This approach, called branch and cut, is considered by many to be one of the main recent advances in the field of combinatorial optimization. 7) Employing the branch and bound framework along with the column generation procedure. This type of algorithm is called branch and price and is most frequently used in large-scale optimization problems. 8) Attempting to use some heuristic such as relaxation induced neighborhood search at several stages of the optimization. 9) Adopting violated cuts along with branch and bound and column generation in a procedure called branch, cut and price. As seen above, solving integer linear programming problems with current technology involves such an extensive range of different procedures that it is not viable to discuss all of them here. Therefore, the theoretical referential related to the subject will concentrate on the less ambitious goal of elucidating the mathematical principles that explain how optimization software actually works. Taking this goal into account, the work adopts the strategy of combining the theoretical aspects with a series of expanded examples taken from: Chen, Batson and Dang’s Applied Integer Programming: Modeling and Solution , G. Srinivasan’s ‘Operations Research, Principles and Applications’  and John E Mitchel’s chapter in “Handbook of Applied Optimization” . Besides these illustrations, completely original cases that encompass essential heuristic and metaheuristic approaches, such as NEH and genetic algorithms, will also be explained in a similar manner. Seeing that success in obtaining a meaningful result using integer linear programming is intrinsically related to curtailing enumeration, this section will try to briefly explain the occasions on which this technique constitutes a suitable option. Notwithstanding the prescriptive connotation of the task, the indications depicted herein do not seek to be exhaustive and ultimately, the efficiency of a determined method must be verified empirically. Apart from this initial warning, an essential but often disregarded aspect concerning the pertinence of integer linear programming is whether is adequate to model a given problem using its typical algebraic formulation. Here, two essential assumptions concerning this approach must be taken into account: the first is linearity and the second is certainty . From a pragmatic point of view, linearity is not particularly restrictive, because it is possible to circumvent this issue with piecewise functions. However, there is no mathematical work-around for the assumption of certainty, and it is often the case that this supposition is not particularly realistic. For instance, in machine scheduling problems, the principle of certainty may be sufficient to portray highly automated manufacturing environments but inadequate to represent settings that involve manual operations. As several computational experiments have demonstrated, if the strategies used to curtail the exponential expansion of the branch and bound tree turn out to be successful, the size of the instance cannot be considered the most important factor related to the adequate performance of modem integer linear programming algorithms . On the contrary, it can be the case that adding variables and constraints to the problem actually improves the running time by either tightening the bounds of the problem or by eliminating significant portions of the branch and bound tree. Still, the abovementioned procedures need to be conducted with parsimony, because the addition of violated cuts can worsen the performance of the simplex algorithm by constantly increasing the size of the input matrix. Besides parsimony, the good use of cutting plane methods is connected to the act of finding a suitable and preferably strong valid inequality. For instance, problems with well-defined structures such as flow-conservation constraints in the network flow problem can take advantage of valid inequalities that are able to eliminate entire facets of the integer convex hull, while more generic instances can at the most benefit from cuts able to separate one or few fractional solutions. - Problem input consists of a total unimodular matrix. - Area bounded by the relaxation is the same as the integer convex hull. - Problem structure allows the use of strong cuts. - Problem structure is favorable to improved formulations. - Integrality gap is small. - Binary integer linear programs. - Problem allows the addition of strong valid inequalities. - Number of integer variables present in the instance is big and methods used to curtail enumeration are not sufficient. - Problem structure contains symmetry. - Violation of integer linear programing assumptions. - The relaxation is unfeasible or is taking too long to be calculated. - Big M constraints are present. After briefly explaining the conditions in which integer linear programming is suitable, the next section will provide a detailed explanation about the topic. Proposed by Land and Doig in 1960 , the branch and bound algorithm was not the first approach used to obtain the exact solution of an integer linear problem, but it became widely used due to its ability to converge faster to the optimal solution, mainly when compared to previous methods such as the complete enumeration of all integer solutions and the fractional cutting plane technique. The rationale behind this approach is not exceedingly complex. Basically, the algorithm implicitly searches the entire space of integer solutions by structuring the problem into a decision tree that is able to discard paths for the reason of infeasibility or inferiority of a given solution. As can be deduced from this explanation, this approach is much more sensible than checking all possibilities by brute force. On the other hand, the method presents a significant deficiency related to the growth rate of the decision tree. This issue arises from the notion that the aforesaid object grows exponentially depending on the number of integer variables. Besides this handicap, there are no guarantees that the branches located at the root of the problem will be eliminated first, thus, it may not always be possible to discard a substantial number of subproblems. Moreover, it can be even the case that all the subproblems must be evaluated. In this last stage of the iterations, node fourteen is eliminated due to the violation of the updated lower bound. Furthermore, node fifteen is discarded due to unfeasibility. Since there are no longer any viable nodes, the problem is finally optimized at node twelve with the value of nine and sixty- seven hundredths . Having demonstrated how the branch and bound method works, the next part of this work will continue the discussion by introducing fractional cutting plane methods. Once more, a clear violation of the integer constraint xi is detected, meaning that the procedure must continue with the generation of another cut. This is still not the only issue with the simplex table above. Taking into account that the fractional cutting plane method is an all integer algorithm, all basic variables, including x4, must be integers. Seeing that there are no more fractional basic variables in the simplex table, the fractional cutting plane algorithm halts, yielding an optimal value of four with x1=2 and x2=2. Once more, it is necessary to emphasize that introduction of the Gomory slack variable at every iteration increases the size of the simplex table. As a consequence of this characteristic, not to mention the weakness of the cuts, the convergence process gets increasingly slower. Therefore, the use the fractional cutting plane method as a standalone tool should be preferably be restricted to simpler integer linear programming instances. A brief examination of the graphic shows that inequality d) cannot be considered valid since it excludes the feasible integer solution denoted by the dots. From the remaining objects, lines a), b) and c) denote valid inequalities. However, it should be noticed that a) does not refer to a violated cut since it does not cross the feasible solution area marked in gray. In addition, it is clear that cut c) is stronger than b) for the reason that the area delimited by b) constitutes a subset of the region bounded by cut c). After introducing the concept of cutting plane methods and explaining their relevance, the next section demonstrates how they can be used in conjunction with the branch and bound technique. Although the branch and cut method seems relatively free of complications, the practical efficiency of the algorithm in terms of convergence is intrinsically related to the manner in which these violated cuts are managed. The most obvious measure in this direction is fathoming the node in case the solution provided by the inclusion of valid inequality does not promote sufficient improvement over previous iterations. Another problem concerning the branch and cut method involves the administration of the number of violated cuts. If an excessive number of valid inequalities is incorporated into the problem, these may slow down convergence due to the extra time that is required to process this new increased formulation. One of the ways to tackle this issue is to discard valid inequalities that do not contribute to the process of convergence by deleting inactive cuts. Other strategies used to circumvent the problem include limiting the number of cuts, skipping certain levels, placing valid inequalities in the upper levels of the decision tree or halting the inclusion of cuts after a certain point. In addition to the aforementioned cut management strategies, practical software implementations of the branch and bound algorithm usually employ this approach in conjunction with other methods, the most important being better formulation by preprocessing and heuristics. To conclude the overview of the branch and cut method, a basic description of the algorithm will be included . Sharing a common step with other approaches, the first stage of the branch and cut method involves estimating the initial relaxation that determines the initial upper bound of the problem. Seeing that fractional values persist, variable x1 is selected arbitrarily and the algorithm will proceed until an optimal integer solution is found. As a way to depict these relationships, a graphic that encompasses the region bounded by the relaxation and the feasible integer solutions is displayed above. For the sake of simplification, the non-binding inequalities x2 < 5 and xt < 10 will be excluded. The results from the calculations performed for node two show that the optimum values related to variables xi and X2 do not violate any integrality conditions and therefore a candidate for an optimal solution is found. As a consequence of this preliminary conclusion, a newer bound for the problem is established and iteration halts in this particular node. However, fractional values can still be verified in node three, therefore the algorithm continues from this area to the next iteration. In the iteration that was just presented, the optimal solution for variables xi and X2 do not violate any integer constraints, a factor that by itself would interrupt the execution of the algorithm at this spot. But more than that, the outcome of the objective function for node four is greater than that obtained in node two, implying that node four must be eliminated from the decision tree for the reason of upper bound. Seeing that the presence viable nodes are exhausted after this last iteration, the problem is optimized at node two with optimum value of minus twenty-eight . To finalize this section, the branch and cut tree above summarizes the procedures made in each node. Notwithstanding the biological character of the approach, GAs are known for obtaining good solutions in a reasonable amount of time, even if the problem at hand involves discontinuities or integer requirements. However, to understand the basis that explains the robustness of GAs, it is necessary to examine the role of the genetic operators as regards facilitating the process of convergence toward an optimal solution and the investigation of the search space. Starting with the first aspect, convergence is stimulated by the pressure exercised through selection and the usual elitist character of the algorithm. However, in GAs, the process of selection is enhanced by a distinct process called crossover that engenders the inheritance of the best traits from the parents to their offspring. Mimicking the process present in natural life, crossover operates by combining the information encoded in the parent’s chromosomes. As regards the second matter of exploring a determined search space, one of the most relevant characteristic of GAs refers to the establishment and maintenance of a population. Assuming that this group presents sufficient size and diversity, the probability of proper investigation of the feasible area increases. Moreover, at an individual level, the stochastic process of mutation further encourages the diversity of solutions by slightly altering offspring. Although GA’s structural logic seems to properly address convergence, the practical implementation of this approach necessarily involves setting the genetic components. Unfortunately, the literature about the subject does not provide exact guidelines on how this task should be performed, but gives only empirical rules. One example in this domain refers to the population component. Whereas it is widely accepted that a relatively small population size would lead to premature convergence of the algorithm, there is no definite criterion for the actual figures that should be used. Moreover, population size is not the only parameter of the algorithm that must be set using empirical criteria. Crossover, mutation and selection are also affected by the same challenge. Still, genetic components do not need to be set up statically but can be configured in a manner that adapts to the problem in hand or to the characteristics of the evolutionary process. As regards the first category, adapting to the context of a problem can occur through a deterministic rule, such as reducing the rate of mutation as generations elapse, or more sophisticatedly, through the process of feedback. The second self-adaptive category is even more refined and involves changes in the structure of the GA. This case encompasses the use of different GA mutation operators according to the success of the procedure. In addition to this, fuzzy inference systems can be used in a number of genetic operators. The Wang, Wang, Hu approach, for instance , consists of two fuzzy controllers that can alter the crossover and mutation ratios according to changes in the average fitness values. The logic of this procedure is straightforward: a) if fitness of the population is stagnated at low level, the crossover and mutation rates should be increased slowly; b) if overall fitness is high, the diversity of the population should be diminished by decreasing the rate of crossover and mutation; c) if average fitness is very close to zero, crossover and mutation should be increased fast. The figure below displays the membership function that was used to transform the crisp values of average function into the categories (NR) negative larger, (NL) negative large, (NM) negative medium, (NS) negative small, (ZE) zero, (PS) positive small, (PM) positive medium, (PL) positive large and (PR) positive larger. “In actual production planning problems, however, the available quantity of a resource in a period is uncertain and possesses different types of fuzziness. Also, the objective defined by the decision maker is an ill-defined goal, or there are some fuzzy parameters in the objective function due to the lack of full understanding of the problem or of the actual maximization and minimization limits. We discuss nonlinear programming problems with the following types of fuzzy objectives and fuzzy resource constraints. Beyond the use of soft computing techniques, it is also possible to combine GAs with local search or other metaheuristic methods. As it will be discussed in section five, the evidence gathered here suggests that the addition of local search accelerates convergence to a global optimum solution in a substantial manner. - Legality: the permutations made in a given chromosome should necessarily lead to a solution. - Completeness: any solution should have a reciprocal chromosomal representation. This proposition is conceived to ensure that any point in the solution space can be reached by genetic search. - Lamarckian property: this principle relates to the ability of a given chromosome representation to facilitate inheritance. If this is not the case, the desirable traits of the offspring will be passed to the next lineage only by random chance. - Non-redundancy: the relation between solutions and encoding should be established on a one-to-one basis to impede frivolous calculations related to the generation of identical offspring. - Causality: small changes on the genotype space caused by mutation should result in equally small changes in the phenotype space. As explained in this section, encoding should not be taken lightly. Understanding the negative consequences of dismissing these properties, the coming chapter of this dissertation will discuss in depth how the proposed solutions manage to strictly abide to these principles and NFL theorems. “It has been proved that an EA optimizing a function over an arbitrary finite space converges to an optimum with a probability 1 under some rather permissive conditions. Simplifying and reformulating the results, it is shown that if in any given population. 3. Any solution can created by the action by the action of variation operators with a nonzero probability. Confirming the findings of Rudolf, authors such as Suzuki , Agapie  and Lozano  arrived to similar conclusions. Seeing that global convergence of GAs is widely accepted, the remaining issue about the method involves the relative efficiency of evolutionary algorithms in general. Although there is still some controversy on the subject, the literature indicates a strong consensus that the convergence properties of a GA can be improved if problem-specific knowledge is incorporated. As commonly happens in this class of heuristics, the initial step of the GA involves creating a set of random solutions. In this example, the initial lineage consists of six chromosomes encoded by the vector [a;b;c;d] that assumes integer values ranging from zero to thirty as a mean to enforce the restrictions present on the problem. In evolutionary algorithms, selection refers to the act of assigning probabilities to chromosomes in such a way that the fittest individuals have the greatest chance of producing offspring. In this example, this goal is achieved by: 1) calculating the cumulative probabilities; 2) using the roulette wheel algorithm to determine the individuals that will form the next generation. R = 0.201, R = 0.284 ,R = 0.099,R = 0.822,R = 0.398, R = 0.501 By placing the random sequence R and the cumulative probabilities P below each other, it is easy to visually match the corresponding vectors and perceive that roulette selection provides the following results: 1) all the members of the population should be included in the next lineage except for chromosome five; 2) given the random vector R, the third individual should be included twice in the mating pool. Apart from this intuitive approach, Hermawanto in the article ‘Genetic algorithm for solving a simple mathematical equality problem’  describes how to perform the roulette wheel procedure in a systematic way by providing an example that demonstrates how to select a chromosome according to the information contained in the random number R.
After determining the individuals that constitute the mating pool, the next phase of the GA encompasses the establishment of a new lineage of offspring by means of recombination of parental chromosomes. Although several different types of genetic operators can be used, it is important for the sake of convergence that the chosen method preferably possesses the Lamarckian property, meaning that recombination should be done in way to ensure that the offspring is able to inherit the best parent’s traits. As regards this example, the one-cut point crossover is sufficient to enforce the desired property. To explain how this genetic operator works in practice, this procedure is performed by choosing a random position in the parent’s chromosomes and then forming the offspring by exchanging this information. 1. Using the NewChromosome gene pool as basis, generate two random sequences containing permutations of integers between one and three and four and six. 2. The aforementioned procedure should yield three couples of parents. Seeing that it is possible to generate two children using one point crossover, it is clear that the population size will remain constant. With the required parameters in hand, recombination proceeds as shown. The cutting points are denoted in the gray shaded area. As shown by the previous step, crossover operates by combining the parents’ genetic material in order to create new offspring. However, the act of creating new beings does not always occur in a deterministic manner but is subject to eventual errors called mutations. Although the possible impacts related to this phenomenon are difficult to evaluate, the usefulness or harm related to the changes promoted by mutation can be more easily perceived in microscopic organisms. One obvious example in this realm is the HIV virus. Consisting of only fifteen proteins and RNA, the reproduction of this simple structure is subject to a series of flaws that tend to occur in relatively little time. In some cases, the aforementioned errors can be advantageous to the retrovirus survival for the reason that they can make a particular strain resistant to certain types of substance normally used to inhibit the organism’s replication. In other cases, mutation can be beneficial to the host, as seen in the loss of fitness of the HIV strains resistant to a substance called lamivudine. As can be easily verified, the current best individual refers to the chromosome that encodes the solution [10,5,3,1] with the fitness value of six. Since the best previous fitness value for this minimization problem was ninety-two, it is possible to verify at this early stage that the algorithm shows signs of convergence. Developed by Nawaz, Enscore and Ham in 1983 , the homonymous NEH algorithm is probably the most relevant deterministic heuristic used to solve permutation flow shop problems. Seeing that NEH continues to be the best-performing algorithm as regards obtaining a solution to the permutation flow shop problem using heuristics, the next section will demonstrate how to implement this approach in practice. After completing the sorting procedure, it is necessary to select the two jobs with the highest sum of the processing times and calculate the makespan related to these partial sequences. Since the jobs that encompass the highest processing times involve jobs jj all that is required is to swap them and obtain the partial sets jj and j3,j1. As denoted by the last Gantt diagram, the minimum makespan obtained by the NEH algorithm is 540 time units. Due to the heuristic nature of the method, this value does not necessarily refer to the exact solution but is situated within 3% of the global optimum. Although this level of precision and complexity can be considered impressive, it is important to recall that the utility of method is limited to permutations schedules. On the contrary of metaheuristics, heuristic methods such as NEH cannot be used in a wide range of problems. This factor highlights the need to study optimization frameworks that allow greater generalization. - A genetic algorithm, from now on denominated ΛGA. - Two hybrid genetic algorithms, from now on called AHGA1 and AHGA2. Having described the overall mechanisms of the proposed algorithms, the next step involves explaining the exact manner in which they were implemented. Here, the main idea is to evidence the adjustments that were made for the sake of performance improvement. In this realm, two basic categories should be mentioned. 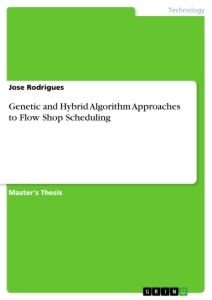 The first encompasses adapting genetic operators, problem representation and objective function to the characteristics of flow shop scheduling. The second assumes the form of local search. In view of the need to match the structure of the problem at hand to the proposed solution methods, the discussion starts with a list provided below. It attempts to summarize the abovementioned strategies, its underlying reasons and some brief technical issues. - Seeing that the number of jobs present on the instance is seven and that the complexity of the problem is 0(n! ), the number of feasible schedules encompasses 7! (5040) sequences. - Given the data above, each feasible schedule consists of unique permutations containing seven digits such as [1,2,3,4,5,6,7],[7,6,5,4,3,2,1]. - Considering the characteristics of the feasible solutions, the proposed algorithms encoded the chromosomes in terms of explicit job permutations. In practice, this task was accomplishing using a Matlab function called randperm. - To explain the advantages of representing the problem using explicit permutations, it must be acknowledged that the set of feasible candidates is substantially smaller than the one that also includes unfeasible solutions, implying a substantial effort to eliminate or assign penalties to them. Taking this computational burden into account, it is clear that the knowledge about the structure of feasible solutions must be incorporated into the proposed ΛGA and AHGA. For a more detailed explanation on this subject, please refer to the next section. - In addition to this, the feasibility of the chromosomes was maintained at all times in the proposed algorithms by using order one crossover and pairwise exchange mutation operator. - Generally speaking, flow shop scheduling problems tend to be characterized by the presence of multiple equivalent solutions. Moreover, the difference between the optimal makespan and a mediocre candidate is often small, implying that mechanisms used to increase the reproductive odds of superior parents must be addressed. Due to these factors, the GA used linear ranking selection as a means to increase the inclusion of fitter genes into the mating pool. - The constraints related to the machines were enforced by adopting discrete event simulation. In addition, this technique also served as a way to calculate the value of the objective function. - Besides the abovementioned strategies, it is also possible to incorporate problem- specific knowledge into a GA by including local search. In the proposed solutions, this approach was applied only to the best chromosome for the sake of maintaining the diversity of the population. - Although the actual benefit of adopting this particular procedure can be only evaluated in an adequate manner after the execution of the GA, the presence of multiple equivalent solutions suggests that is useful to augment the efficiency of the process of searching for an improved schedule by introducing different types of local search  . The techniques used to search the vicinity of the best solution provided by the GA are depicted below. 1. To avoid errors concerning memory allocation in Matlab due to arrays and matrices that have no pre-defined size, the number of jobs present in the instance was reduced to seven. 2. The number of machines was reduced to two in order to: a) verify the results in polynomial time, b) ensure that the algorithm is converging to the global optimum, and c) guarantee that there are absolutely no mistakes related to makespan evaluation. 3. Even though it would be pertinent for the sake of performance to add the NEH algorithm to initialize the proposed solutions, this approach was avoided to facilitate convergence analysis. Typically, flow shop scheduling is formulated using integer linear programming, sets of recursive equations or by simulating a determined manufacturing environment. In spite of the diversity of possibilities, the last approach was selected to represent the proposed GA and ΛHGAs due to the ease of implementation and favorable properties. As previously mentioned, using discrete event simulations means that it is not necessary to increase the number of integer variables according to the complexity of the manufacturing environment, as it would occur with integer linear programming. On the contrary, adopting the representation approach proposed here only increases the size of the problem in respect to the number of jobs. Moreover, integer linear programming searches the area bounded by the relaxation, implying that unfeasible candidates will likely be evaluated. In contrast, using genetic algorithms does not require investigation of any unfeasible candidate as long as certain conditions contemplated in the proposed solutions hold: 1) the genetic operators are properly adjusted to the characteristics of the feasible solution, 2) the constraints related to the machines are enforced and, 3) the solution vector is explicitly denoted in terms of unique permutations. Tables 4.2.1 and 4.2.2 use a three job example to evidence the amount of frivolous calculations required to search a space wider than the domain of feasible permutation of jobs. Reinforcing the idea that integer linear programming searches a space that is wider than the feasible permutation of jobs, a sample formulation of the flow shop scheduling problem proposed by Sawik  will be included. However, before this brief analysis takes place, it is important to note that the author uses a slightly different terminology. Here, machines are called stages and jobs refer to parts. Besides this issue of terms, this expanded example presents every constraint individually instead of their compact form for the sake of clarification. Having previously discussed the strategies of knowledge incorporation adopted in the proposed solutions, the focus of this section will shift to the following aspects: 1) demonstrate how the genetic operators used in the proposed ΛGA and AHGAs were implemented in practice, and 2) prove that the aforementioned procedures cannot generate unfeasible offspring granted that the input data consists of unique permutations. 2. With π and r2 in hand, use this information to select the corresponding portion of the parent one chromosome and highlight it. 3. Compare the highlighted genes from parent one with parent two and eliminate the redundant information from the last individual. 5. Insert the remaining genes from P2 into the empty slots of O1. If P1 and P2 consist of unique permutations, O1 must be feasible. 6. Inverse the vectors that encode the genes P1 and P2 and repeat steps one to five to obtain a second child. Developing the idea that the genetic operators used here do not generate unfeasible chromosomes, the next section will demonstrate the practical implementation of the mutation operator. - Given the sequence of jobs, exchange two random positions to obtain a new candidate. Apart from crossover and mutation, selection also plays an important role in the domain of matching the structure of a problem at hand to the GA. The next section deals exactly with this topic. Selection  involves determining the individuals that are going to produce offspring. In many cases, the act of designating candidate solutions that will make part of the mating pool can be simply achieved by using raw fitness values as a criteria as shown in the previous example. However, this type of approach can lead to undesired events such as premature converge or stagnation. To circumvent the negative consequences related to choosing a pool of chromosomes strictly on the basis of their fitness values, fitness proportional selection is typically replaced by ranking selection. 1. Evaluate the makespan for every individual and rank the solutions so that the fittest individuals are assigned a highest score. In addition, assign the same level of importance for sequences that have the same makespan. 3. Calculate the cumulative probabilities and perform roulette selection using the standard procedure. Understanding that the proposed solutions are grounded on solid theoretical foundation, the next part of this work will proceed with analysis of the results. In this realm, the goal is to verify whether the particular choices made in the design of the proposed solutions are able to empirically mitigate the computational burden associated with the flow shop scheduling problem. As the title implies, the main goal of this chapter is to present and analyze the performance of the proposed solutions. Providing an overview about the subject, the evidence gathered in this dissertation shows that the hybrid versions were especially suitable for reducing the computational burden associated with the flow shop scheduling problem. As discussed before, and consonant to the theory about the matter, this advantage can be credited to the addition of local search, a procedure that intrinsically operates in the direction of incorporating specific-problem knowledge. Apart from reporting and interpreting the results, this chapter also debates improvements to the existing framework. Having provided a brief introduction about the structure of this chapter, the following section will proceed with the quantitative analysis of the proposed solutions. Due to the stochastic components present in evolutionary algorithms, it may be a challenging task to evaluate their performance with fairness. Using GAs as a reference the optimal result can be reached almost immediately or in several generations. Acknowledging these difficulties, the initial methodology was to create three distinct samples, each referring to the due proposed solution, consisting of thirty trials each. Besides issues concerning sampling techniques, an important aspect related to performance involves the criterion used to measure the efficiency of a determined algorithm. In view of the diversity of hardware, coding techniques and computer languages, the approach used to estimate the success of the proposed solution methods involved measuring the number of evaluations required to find the exact solution, instead of elapsed time. Even though the results obtained can be described as encouraging, the descriptive information displayed above is insufficient for making accurate inferences about the efficiency of the proposed algorithms. Due to the seriousness of this limitation, a nonparametric estimator called Kaplan­Meier  was used to analyze the study data with the deserved rigor. For the sake of making the reader familiar with the subject, studies that employ the method are widely used in an area of statistics called survival analysis    . One important characteristic concerning the Kaplan-Meier estimator is that the sampling admits censoring. Usually, this circumstance occurs either when an individual abandons a determined study or when the event of interest has already happened before enrollment. In addition to censoring issues, the efficacy of Kaplan-Meier estimators requires that certain criteria are met, namely : 1) independence of the sample, 2) independence of censoring, 3) uniformity in the time interval used to verify the status of the individuals, and 4) reasonable number of censored values. Even though these assumptions pose obvious challenges in several empirical studies, they are unlikely to be violated while evaluating the proposed algorithms, because computer simulations establish a controlled environment. Here, the presence of aspects that complicate the initiative of applying the Kaplan-Meier method is either unimportant or completely manageable. To evidence the validity of the statement above, assessing the performance of the proposed algorithms is unlikely to involve circumstances such as subjects that abandon the study, implicit factors that may hinder the independence of the sample, inconsistent data collection intervals or practical constraints related to the duration of the study. On the contrary, the sample gathered herein is characterized by: 1) uncensored data, 2) trials consisting of identical instances, 3) rigid data collection periodicity, and 4) absence of limits as regards following up the individuals until the event of interest occurs. Notwithstanding the clear performance advantage of the hybrid version (AHGA1), table 5.3 shows that there is no overlap between the confidence interval values, which indicates that the differences observed may be statistically significant. Providing further evidence that this may be the case, the plot concerning survival function curves appear to be separated except in the very early moments. Complementing what was said about the visual inspection, it is important to mention that the time units displayed in the chart refer to generations and that these encompass multiples of fifty iterations. ΛHGA1, this event occurs after a good solution is constructed by the AGA algorithm, whereas AHGA2 alternates both procedures using the first improvement criteria. As the tables below denote, the design of the analysis is exactly the same as in the previous case. However, the conclusions are quite the opposite, in view that the differences between the survival curves are far from statistical significance. As a result of the failure to reject the null hypothesis, it can be stated with confidence that timing does not play any role in improving the convergence properties of the algorithms under analysis, at least in the instance that was observed. Moreover, the presence of overlapping curves and confidence interval values denotes the consistency of the estimates. To make an additional remark about the Kaplan-Meyer estimator, it is worth mentioning that the abovementioned statistical significance tests have very similar null hypotheses, except that they tend to emphasize different moments of the survival curve. For instance, while the Mantel-Cox test places greater importance on events that happen later in time, Wilcoxon tends to value occurrences that appear earlier, and Tarone-Ware contemplates the intermediate position. Finally, it is important to state that the same set of statistics performed above was also applied to the ΛGA and AHGA2 samples. As implied, the results obtained were equivalent. This means the null hypothesis was rejected for all tests at any conventional level. As the quantitative analysis demonstrated, the proposed algorithms were able to provide solutions that were equal to the optimal one in every single trial performed. This finding should not be considered particularly surprising due to the elitism of the methods under analysis, the modest size of the instance and the efforts used to match the characteristics of the proposed algorithms to the problem. Moreover, the data also showed that the hybrid versions (ΛHGA1 and ΛHGA2), were able to lessen the burden of exhaustive search by around 94%. In spite of the encouraging results, it is important to notice that the last conclusion cannot be necessarily extrapolated to other instances, due to insufficient quantitative evidence. On the other hand, it is important to state that the attributes of the instance used herein were deliberately chosen to make the optimization process as difficult as the benchmark cases available in the literature. The only substantial alteration refers to the reduced size of the instance. Recalling what was previously affirmed, problems that contain multiple equivalent solutions tend to be hard to solve, and these are exactly the characteristics of the particular problem that was used to generate the data. In this direction, previous fitness values calculations showed that, from an initial population consisting of twenty-five chromosomes, only ten could provide unique makespan values, not to mention that the relative difference between the best current candidate and the worse was only 15.30%. Besides the use of local search, eliminating the evaluation of unfeasible solutions by explicitly denoting permutations played a good part in improving the performance of the algorithms. Clearly, there is no justification for examining unfeasible solutions when the method can be adjusted in a way to exclude them from the input of the problem. Having emphasized some of the reasons that underpin the superiority of the hybrid genetic algorithms approach, the next part of this work will discuss possible ways to improve the results obtained so far. As mentioned before, increasing the scale of the problem necessarily involves rewriting the code so that memory allocation issues cannot occur. From a pragmatic standpoint, this goal is achieved by creating a series of dummy zero filled matrices. Moreover, developing the code in Matlab may not be the best option, because of the cost and slow performance. Understanding the need to rewrite the proposed algorithms, three alternatives were considered: Fortran 90 , C++  with the Eigen library or Julia. Given the comparable performance to C++, expressive syntax, stability, integration with other languages and tools that simplify parallel computing, Julia  was selected. This updated code can be verified in the Appendix for reference and reproduction of results. As can be inferred from the data above, iterated greedy closely resembles ILS. The difference between these two approaches is that instead of applying a random perturbation, the iterated greedy algorithm operates by removing a certain number of components and reinserting them later with a greedy heuristic. In the method to solve the flow shop scheduling problem proposed by Ruiz and Stützle , this process of destruction and construction is performed by selecting a random number of jobs and inserting the remaining elements of the sequence using the NEH heuristic. Even though the results are still preliminary, brief tests that were made using ΛGA along with an iterated greedy algorithm, indicated that this combination was able to achieve the upper bound for two of the 20 jobs, 5 machines problems from the Taillard benchmark in no more than 50 seconds. However, this result can be further improved by making this algorithm closer to the one proposed by Ruiz and Stützle  by: 1) using the more efficient NEH-T instead of NEH, 2) employing first improvement instead of best improvement, 3) addressing the issues of ties and 3) changing the acceptance criteria from deterministic to one that resembles simulated annealing. Understanding that the initial code has already been written and is functional, it will also be included in the Appendix. Finally, it is important to say that the hybridization proposed here is justified by the fact that the original iterated greedy algorithm performance degrades as the size of the instances increases. This factor suggests that including an approach with a proof of convergence such as GA makes sense in the given circumstances. Understanding flow shop scheduling is proven to be mathematically intractable in the vast majority of cases, the goal of this dissertation was to develop methods capable of mitigating the computational burden associated with the problem. In this realm, three solutions were proposed. The first approach refers to a genetic algorithm that employed discrete event simulation and customized genetic operators as a means to eliminate the evaluation of unfeasible solutions and incorporate problem-specific knowledge. The second and third proposed solutions consist of hybrid methods that have improved the aforementioned framework by including local search. Computational experiments that used the Kaplan-Meier estimator to evaluate the performance of the algorithms demonstrated that the hybrid versions were able, at a worst-case scenario, to achieve exact results by investigating no more than six percent of the total number of feasible schedules. Granted that the evidence gathered so far suggests that the hybrid versions of the proposed algorithms managed to substantially reduce the onus associated with the factorial complexity of the flow shop scheduling problem, expanding the framework in the direction of intensifying local search seems to be a plausible method of improvement. In this realm, preliminary studies have demonstrated that a new method that adds the iterated greedy algorithm to the current GA framework is capable of tackling some Taillard's benchmark instances in no more than 50 seconds. Tootmise planeerimine on paljudel juhtudel matemaatiliselt keerukas ülesanne. Antud magistritöö eesmärk on algoritmide arendamine, mis aitavad vähendada/ületada käsitletava probleemi arvutuslikku keerukust. Magistritöös on töötatud välja kolm erinevat lahendust. Esimene lahendus pöhineb geneetilise algoritmi operaatorite kohandamisel konkreetse üleande spetsiifikale vastavate diskreetsete sündmuste simuleerimiseks eemärgiga ellimineerida mittelubatavad lahendid ja kiirendada algoritmi tööd. Teine ja kolmas lahendus koosnevad hübriidmeetoditest kus eespooltoodud meetodile on lisatud lokaalne otsing. Koostatud lahendusi hinnati kasutates numbrilisi eksperimente ja Kaplan - Maieri statistikat. Tulemusena tuvastati, et hübriidmeetoditel pöhinevad lahendused koonduvad halvimal juhul täpseks lahendiks kui kaasatud on vähemalt kuus protsenti lubatud lahenditest. Väites, et hübriid versioonid pakutud algoritmidest suutsid märgatavalt vähendada peavalu seostatud faktoriaalse komplekssusega matemaatilisel planeerimisel, laiendades metoodikat vöimsama lokaalse otsingu suunas tundub olevat öige tee edasi. Selles vallas algelised uuringud on näidanud, et uus meetod kus on lisaks olevale geneetilisele algoritmile ka itereeritud "ahne" algoritm, on suuteline murdma möningaid Taillard-i seatud ülesandeid vähem kui 50 sekundiga. Having provided the due theoretical and practical evidence about the logic that underlies the proposed methods, this part of the work explicitly reveals the details of the Julia code. As shown below, the first set of instructions refers to the ΛGA and the others relate to the hybrid variants. P. Brucker, Scheduling Algorithms, Berlin, Heidelberg, New York: Springer-Verlag Berlin Heidelberg GmbH, 2004. A. A. Juan, H. R. M. Lourenço, R. Luo and Q. Castella, "Using iterated local search for solving the flow-shop problem: Parallelization, parametrization, and randomization issues," International Transactions in Operational Research, vol. 21, no. 1, p. 103-126, January 2014. S. S. Rao, Engineering Optimization: Theory and Practice, Hoboken: Wiley, 2009. L. A. Wolsey, Integer Programming, Hoboken: Wiley-Interscience, 1998. M. Conforti, G. Cornuejols and G. Zambelli, Integer Programming (Graduate Texts in Mathematics), New York: Springer, 2014. G. Sierskma, Linear and Integer Programming: Theory and Practice, Boca Raton: CRC, 1996. V. T. Paschos, Applications of Combinatorial Optimization, Hoboken: Wiley-ISTE, 2014. J. W. Chinneck, "http://www.sce.carleton.ca," [Online]. Available: http://www.sce.carleton.ca/faculty/chinneck/po.html. [Accessed 18 7 2015]. D. Wolpert and W. Macready, "No free lunch theorems for optimization," Evolutionary Computation, IEEE Transactions, Volume:1, Issue:1, p. 67, April 1997. R. Graham, M. Grotschel and L. Lovasz, Handbook of Combinatorics, Amsterdam: North Holland, 2010. L. Wolsey and G. Nemhauser, Integer and Combinatorial Optimization, Hoboken: Wiley, 1999. A. Schrijver, Theory of Linear and Integer Programming, Hoboken: Wiley, 1998. A. Schrijver, Combinatorial Optimization (3 volume, A,B, & C), New York: Springer, 2003. M. Garey, D. Johnson and R. Sethi, "The complexity of flowshop and jobshop scheduling," Mathematics of Operations Research, vol. 1, no. 2, 1976. M. Piñedo, Scheduling:Theory,Algorithms and Systems, New York: Springer, 2008. N. Gupta, "A review of flowshop scheduling research," in Disaggregation:Problems in manufacturing and service organizations, New York, Springer, 1979. V. Klee and G. Minty, "How good is the simplex algorithm?," in Proceedings of the Third Symposium on Inequalities held at the University of California, Los Angeles, Calif., September 1-9, 1969, Los Angeles, 1972. M. R. Garey and D. Johnson, Computers and Intractability: A Guide to the Theory of NP-Completeness, New York: W. H. Freeman, 1979. S. Cook, "The complexity of theorem-proving procedures," in Proceedings of the Third Annual ACM Symposium on Theory of Computing. [S.l. : s.n. ], 1971. 151-158 p., New York, 1971. L. Levin, "Universal search problems," Annals of the History of Computing, vol. 6, no. 4, 1984. S. Dasgupta, C. Papadimutriou and U. Vazirani, "NP-complete problems," in Algorithms, New York, McGraw-Hill Education, 2006, pp. 233-263. G. Spoerer, A. Kendall and K. Parkes, "A Survey of NP-Complete Puzzles," ICGA Journal, 2008. T. Walsh, "http://arxiv.org/," March 2014. [Online]. Available: http://arxiv.org/abs/1403.1911. [Accessed 18 7 2015]. I. Lynce and J. Ouaknine, "http://sat.inesc-id.pt," [Online]. Available: http://sat.inesc- id.pt/~ines/publications/aimath06.pdf. [Accessed 18 7 2015]. J. Stuckman and G.-Q. Zhang, "http://arxiv.org/," 2005. [Online]. Available: http://arxiv.org/pdf/cs/0512049.pdf. [Accessed 18 7 2015]. H. Emmons and G. Varaiktarakis, Flow Shop Scheduling: Theoretical Results, Algorithms and Applications, New York: Springer, 2013. M. Seda, "Mathematical Models of Flow Shop and JobShop Scheduling Problems," International Journal of Applied Mathematics and Computer Sciences, vol. 4, no. 4, 2007. E. Johnson, G. Nemhauser and M. Savelsbergh, "Progress in Linear Programming-Based Algorithms for Integer Programming: An Exposition," INFORMS Journal on Computing, vol. 12, no. 1, 2010. F. Margot, "Symmetry in Integer Linear Programming," in 50 Years of Integer Programming 1958-2008:, Springer, New York, From the Early Years to the State-of-the-Art. N. Tyagil, R. Varshney and A. Chandramouli, "Six Decades of Flowshop Scheduling Research," International Journal of Scientific & Engineering Research, vol. 4, no. 9, 2013. G. Raidl, " A Unified View on Hybrid Metaheuristics," vol. 4030, 2006. C. Der-San, R. G. Batson and Y. Dang, Applied Integer Programming:Modeling and Solution, Hoboken: Wiley, 2010. G. Srinivasan, Operations Research: Principles and Applications, New Delhi: Prentice-Hall of India, 2010. J. Mitchel, "Handbook of Applied Optimization," in Branch-and-cut Algorithms for combinatorial optimization problems, Oxford, Oxford Press, 2002. C. H. Papadimitriou and K. Steiglitz, Combinatorial Optimization: Algorithms and Complexity, Mineola: Dover Publications, 1998. A. Land and A. Doig, "An automatic method of solving discrete programming problems," Econometrica, vol. 28, no. 3, 1960. E. Klotz and A. Newman, "Practical Guidelines for Solving Difficult Mixed Integer Linear Programs," 2013. [Online]. Available: http://inside.mines.edu/~anewman/MIP_practice120212.pdf. [Accessed 18 July 2015]. P. C. Pop, Generalized Network Design Problems: Modeling and Optimization, Berlin/Boston: Walter de Gruyter, 2012. M. Gen and R. Chen, Genetic Algorithms and Engineering Design, Hoboken: Wiley, 1997. P. Wang, G. Wang and Z. Hu, "Speeding up the search process of genetic algorithm by fuzzy logic," in Proceeding of the 5 th European Congress on Intelligent Techniques and Soft Computing, Aachen, 1997. A. Eiben and J. Smith, Introduction to evolutionary computing, New York: Springer Science and Business Media, 2003. A. Eiben, E. Aarts and K. Van Hee, "Global convergence of genetic algorithms: A markov chain analysis," Lecture Notes in Computer Science, vol. 496, 1991. G. Rudolf, "Convergence Analysis of canonical genetic algorithms," IEEE Transactions on Neural Networks, vol. 5, no. 1, 1994. J. Suzuki, "A Markov chain analysis on simple genetic algorithms," Systems, Man and Cybernetics, vol. 25, no. 4, 1995. A. Agapie, "Genetic Algorithms: Minimal Conditions for," in Third European Conference on Artificial Evolution, Nimes, 1998. J. Lozano, "Genetic algorithms: bridging the convergence gap," Theoretical Computer Science, no. 229, 1999. D. Hermawanto, "http://arxiv.org," [Online]. Available: http://arxiv.org/ftp/arxiv/papers/1308/1308.4675.pdf. [Accessed 19 7 2015]. M. Nawaz, E. Enscore Jr and I. Ham, "A heuristic algorithm for the m-machine, n-job flow-shop sequencing problem," Omega, vol. 11, no. 1, 1993. É. D. Taillard, " Some efficient heuristic methods for the flow shop sequencing problem," European Journal of Operational Research, vol. 47, no. 1, 1990. S. Jena, M. Poggi de Aragäo and D. Sotelo da Siva, "Competitive Deterministic Heuristics for Permutation Flow Shop Scheduling," Monografías em Ciência da Computaçâo, no. 9, 2009. Z. Michalewicz and D. B. Fogel, How to Solve It: Modern Heuristics, Berlin: Springer Science & Business Media, 2004. T. Sawik, Scheduling in Supply Chains Using Mixed Integer Programming, Hoboken: Wiley, 2011. Rubicite Interactive, "www.rubicite.com," [Online]. Available: http://www.rubicite.com/Tutorials/GeneticAlgorithms/CrossoverOperators/Order1CrossoverOperator.aspx. [Accessed 15 July 2015]. J. Montgomery, "www.academia.edu," November 2002. [Online]. Available: http://www.academia.edu/2808100/The_No_Free_Lunch_Theorems_for_Optimisation_An_Overview. [Accessed 18 July 2015]. N. Krasnagor, A. Aragón and J. Pacheco, "Memetic Algorithms," in Metaheuristic Procedures for Training Neural Networks, New York, Springer, 2006. E. Kaplan and P. Meier, "Nonparametric Estimation from Incomplete Observations," Journal of the American Statistical Association,, vol. 53, no. 282, 1958. D. G. Kleinbaum, Survival Analysis: A Self-Learning Text, Third Edition, Springer: New York, 2011. J. P. M. Klein, Survival Analysis: Techniques for Censored and Truncated Data, New York: Springer, 2005. Swiss HIV Cohort Study, "Clinical progression, survival, and immune recovery during antiretroviral therapy in patients with HIV-1 and hepatitis C virus coinfection: the Swiss HIV Cohort Study," The Lancet, vol. 356, no. 9244, 2000. P. Moscato and C. Cotta, "A Gentle Introduction to Memetic Algorithms," in Handbook of Metaheuristics, New York, Springer US, 2003, pp. 105-144. J. M. Ortega, An Introduction to Fortran 90 for Scientific Computing, Oxford: Oxford University Press, 1994. J. Pitt-Francis and J. Whiteley, Guide to Scientific Computing in C++, New York: Springer, 2012. I. Balbaert, Getting started with Julia Programming Language, Birmingham: Packt Publishing, 2015. R. Ruiz and T. Stützle, "A simple and effective iterated greedy algorithm for the permutation flowshop scheduling problem," European Journal of Operational Research, vol. 177, no. 3, pp. 2033-2049, 16 March 2007.